This was purely a nostalgia grab--I had read at least half of the content here as a teen in the 90s when Dork was new. Much of the humor is dated (Generation Ecch is less interesting when most of them are balding now), but the absurd is still great and the art is wonderful. Who's Laughing Now? is a graphic novel collecting work from the first five issues of Evan Dorkin's comic book Dork, as well as additional content originally meant for other projects. Dorkin excels in the short format, and so his dark and irreverent humor really shines in this collection, whether it's with the serialized adventures of The Murder Family, the Fisher-Price Theater, or the pages of three-panel "comic strips" near the end. For those familiar with Evan Dorkin's work, this graphic novel will appeal more towards fans of Milk & Cheese and the The Eltingville Club than those who read Pirate Corps or his adaptations of the Bill & Ted films, but the Devil Puppet assures you that you WILL enjoy it. 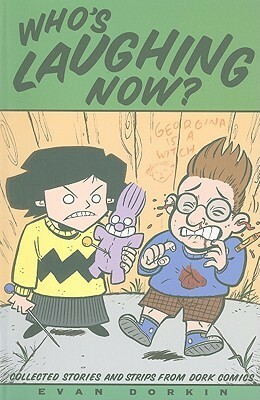 Evan Dorkin is either a comedic genius or a very disturbed man and you should avoid making eye contact with him.This collection of a wide array of short stories and tiny gag strips, goes from hilarious, to chuckle worthy, to cringe-inducing to WTF!.Sometimes on the same page.Wonderful, twisted and never boring. This is OMG good! Read all of his stuff.